As a food blogger, I often feel pressured to write recipes that present with a certain “wow factor.” I think it’s in part about wanting to be innovative and interesting, and when I develop those kinds of recipes I definitely feel a sense of accomplishment, like I’m really stretching my creative muscles. Plus, the pretty, complicated, or outside-the-box dishes are a fun addition to any food-centric narrative. I think that it can be easy to get caught up in cooking to impress, though. There’s nothing wrong with wanting to flaunt your culinary prowess, but it’s not exactly a sustainable daily practice. It’s certainly not the norm around here, especially as of late. Sometimes you just need to eat. Still, when deciding what to make for dinner, there are many times when I find myself questioning whether what I’m about to cook will be blog-worthy. Blog-worthy? What does that even mean? Should everything I put on this blog be stunning to look at or fun to say or full of ingredients that you may or may not be able to readily find? If I’ve made it and Chris and I enjoy it—sometimes enough to have it several nights in a row and make it all over again—isn’t that good enough? Also, in an effort to eat better, I’m baking much less these days. I don’t feel too bad about this. The past few months were filled to the brim with cakes and fritters and all sorts of goodies that will hopefully keep your ovens busy while the focus here shifts for a bit. There will still be sweet treats, but you may notice a change in their tone. Serious baking will be far more occasional. So, I’m going to loosen up my silly concerns regarding what a blog-worthy recipe is. It doesn’t have to be a fancy baked good or a decadent, multi-step main course. Weeknight dinners are now fair game. I’m sure many of you will appreciate the more everyday attitude of these recipes. 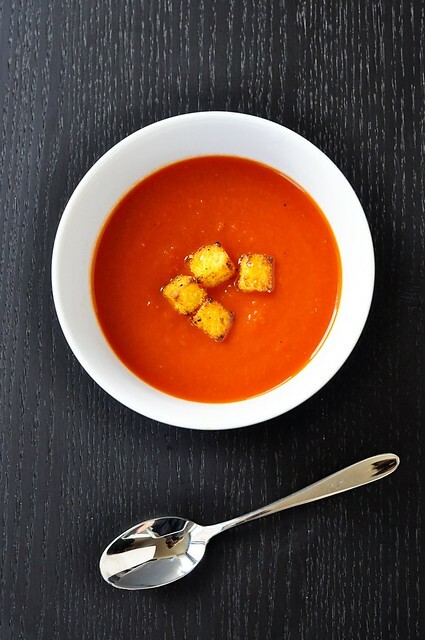 Let’s start things off right with a roasted garlic tomato soup. This soup was something I threw together one morning so that I could bring a jar of home-cooking to a friend and also save a small stash in the fridge for me and Chris. The “hardest” part of the whole thing is roasting the head of garlic, which really isn’t so hard at all (see roasted garlic step-by-step). The rest is a tiny bit of chopping and sautéing, opening a couple cans, and blending it all together. Full of sweet, buttery, roasted garlic flavor, it only tastes like it’s complicated. You can serve this healthy soup all on it’s own or as a side with dinner—it’s particularly nice with foods that lend themselves to dipping. While it doesn’t need a garnish, a sprinkling of chopped herbs or dollop of something creamy never hurts. 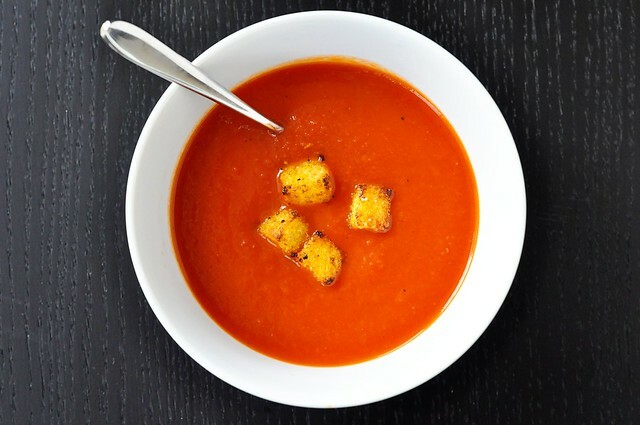 You can find out how to make those cute little polenta croutons here. Preheat the oven to 425 degrees. Cut off the top third of the head of garlic and use the tip of your knife to pop the tops off any remaining cloves. Set the head of garlic on a piece of foil, drizzle it with olive oil and sprinkle with a pinch of salt. Gather the corners of the foil above the head of garlic and wrap it into a little package. Roast in the oven for 45 minutes. Remove and allow to cool enough to handle. Place a medium sized pot over med-high heat. Add about 2 tablespoons of olive oil and, once it is hot but not smoking, drop in the chopped onion. Season with a good pinch of kosher salt and black pepper, and sauté until translucent and just beginning to turn golden brown. Add the raw garlic sauté for one min. Next, add the tomato paste and squeeze the head of roasted garlic upside down over the pot, squishing the softened cloves out of the papery skin. 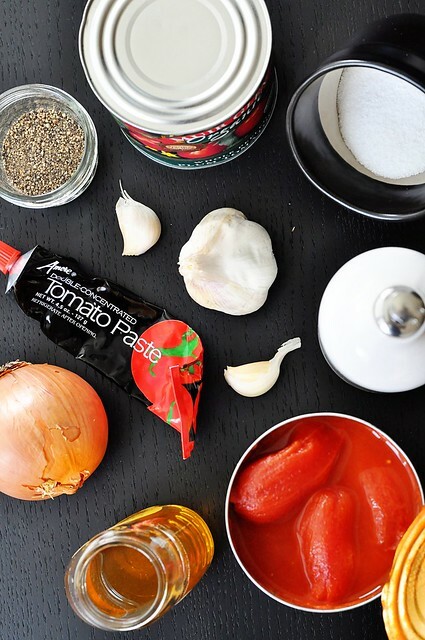 Pour in the tomatoes, breaking them up coarsely with a spoon or potato masher. Stir in the water, bring to a simmer, and cook until the tomatoes have softened, about 15-20 minutes. 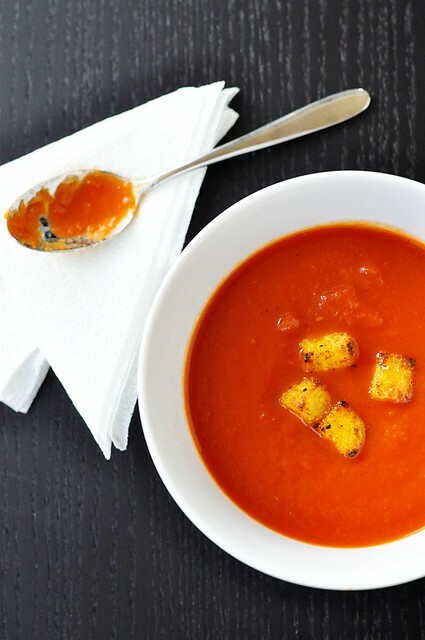 Carefully transfer the soup to a food processor (alternatively, use a regular or immersion blender), working in batches if necessary, and puree for several minutes until smooth. Return the soup to the pot and place over medium heat. Stir in the honey and season to taste with salt & pepper. 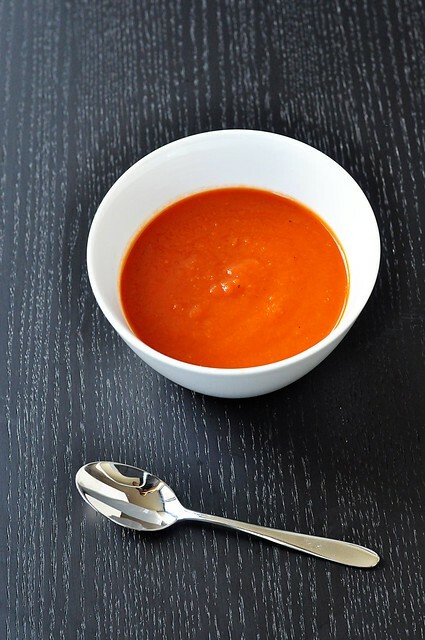 Depending on how meaty your tomatoes were, you may want to pour in a bit more water to thin the soup to your liking. Cook for an additional 10 minutes or so to allow the flavors to blend.